With All Noise Control, the solution was simple. ANC-WB22 Wrap Barrier product was just what the Lockheed facility needed. Achieving STC ratings from 26 to 30 the Wrap Barrier will offer a 15 to 20 decibel level drop from unwanted noise. 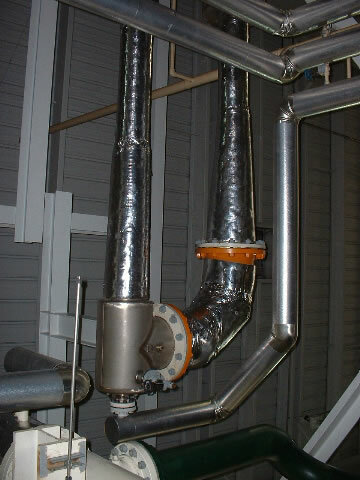 Securing the pipes and insulating them with All Noise Control Wrap Barrier absorbs the noise coming from the source, reduces the vibrations of the pipes and therefore significantly lowering the decibel level of equipment noise. In addition to the Wrap Barrier, All Noise Control has some fantastic acoustic blanket products that can also isolate a noise source. But even with that type of enclosure the noise will continue to travel through available materials it connects to. After using All Noise Control’s Wrap Barrier product Lockheed was able to achieve an acceptable noise level according to OSHA and more importantly it’s employees. Whenever there is high noise levels, productivity does suffer due to noise fatigue. Other undesirable conditions occur often lowering overall happiness and productivity in a work place. We invite you to call All Noise Control at 561-964-9360 to discuss the noise control materials supplied to this particular middle school and are just as happy to listen to your individual needs and supply you with a customized All Noise Control Solution. You may also visit our wrap barrier product page and for related equipment noise solutions our acoustic blanket page for more information at www.allnoisecontrol.com.